*1: Latest system software update required. Follow the instructions below to check the lens system software version. 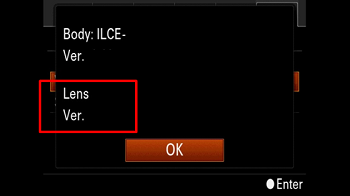 Lens system software version [Ver.01] or earlier, should be updated. 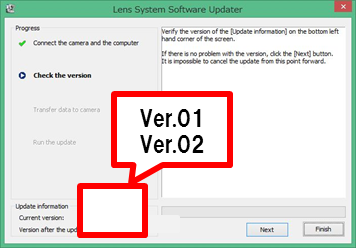 Lens system software version [Ver.02], the update is not required. Select Menu →Setup → Version on the camera. The lens system software version is displayed as illustrated below. 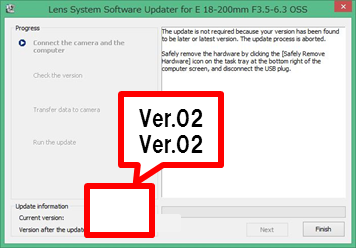 If you are using the QX series, start the lens system software updater on your PC and check the lens system software version by running the update. Note: Please close all other application software before updating the lens system software. Note: The update can be performed only when the remaining battery level is (three marks) or more. We recommend that you use a fully charged battery or the dedicated AC adapter (sold separately). Detach the vertical grip when you update lens system software. 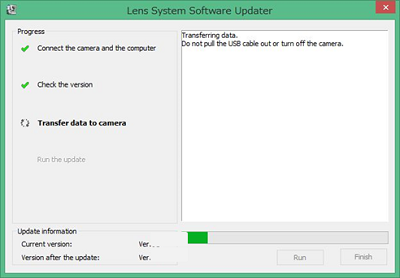 This Lens system software update can be performed only when the lens is attached to the camera. 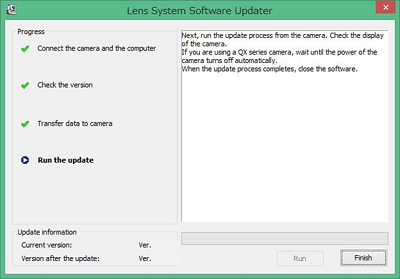 You cannot perform the Lens system software update using other camera. Attach the lens to the camera before performing the lens system software update. Make sure the camera is turned off. Make sure that you are logged on as a user with administrative rights. Read the disclaimer and agree to the terms and conditions by clicking the tick box. Then, click on the Download button. The download of the [Update_SEL100400GMV2D.exe] file will start. Once the file has downloaded successfully, you're ready to install the lens system software update Ver.02 for SEL100400GM. Double-click the [Update_SEL100400GMV2D.exe] file you downloaded to start up the lens system software updater. The lens system software updater window appears. Turn on the camera. If the camera has already been turned on, turn it off and then turn it on again. 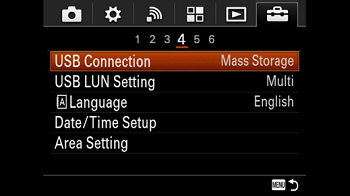 According to the instruction on Lens System Software Updater, select [Menu] → [Setup] → [USB Connection] on the camera, and check if [Mass Storage] is selected. (If you are using the QX series, this step is not necessary.) If the mode other than [Mass Storage] is selected, please select [Mass Storage]. Remove the memory card from the camera beforehand. Connect the camera to the computer with the supplied USB cable. 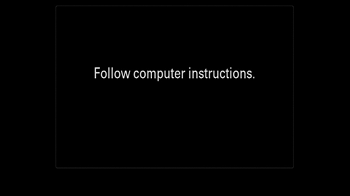 If an error message appears on the computer screen, please try the following methods. - Disconnect the USB cable from the camera, then reconnect the USB cable. - If there are another USB terminal with the computer, reconnect the USB cable to another USB terminal. Confirm is displayed on the task tray at the lower right corner of the computer screen. Note: is not displayed on the task tray, please proceed to the next step. Click Next on the lens system software updater. The lens system software updater window appears on the PC and "Follow computer instructions." appears on the camera screen. Note: From now on, never turn off the camera until the Lens system software update is completed. It might takes a few minutes to screen changes depending on the camera model. If the messsage "The update is not available for your model." appears, check if the system software file you're trying to install is the correct file for the lens which is attached to your camera. 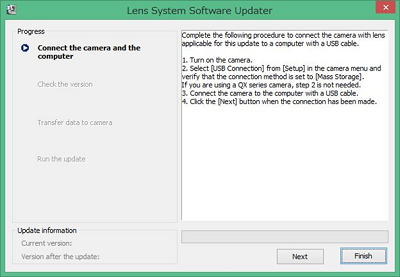 In case the correct lens system software updater is running, close the updater, disconnect the USB cable, turn off the camera, and go back to step 1 "Start up lens system software updater". Click Next on the lens system software updater. The current version and the version after the update appear on the lower left part of the screen. 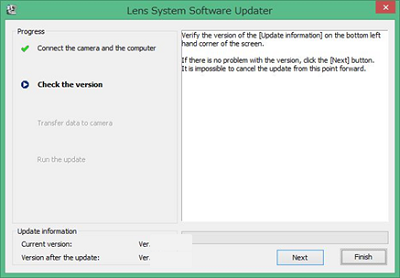 If the current lens system software version is .02 or later, the update is not required. In this case stop the USB connection and click Finish, turn off the camera, remove the battery pack and/or the AC adapter, reinsert the battery or reconnect the AC adapter and turn on the camera. Confirm [Current version] is . 01, click [Next]. The data is being transferred to the camera (approximately 5 seconds). 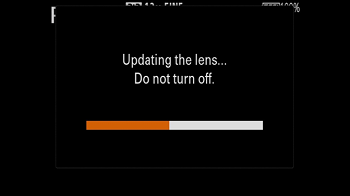 The update process starts and the progress bars is displayed on the camera (approximately 30 seconds). 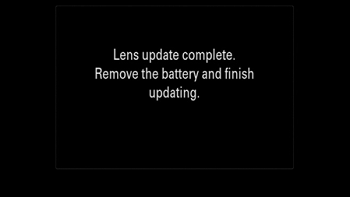 The update process is finished when the "Lens update complete." message is displayed on the camera. If you are using the QX series, the update process is finished when the screen of the QX series disappears. Click on the task tray at the lower right corner of the computer screen to stop the USB connection. Note: After finished the update, turn off the camera, remove the battery pack and/or the AC adapter, reinsert the battery or reconnect the AC adapter and turn on the camera. Step 2: Confirm the lens system software version is Ver.02 . On the camera select Menu → Setup → Version.